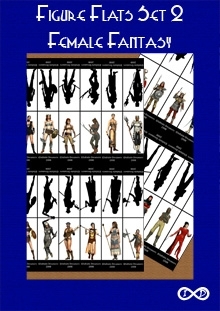 This set provides 36 different female fantasy hero paper miniatures. These full colour miniatures are provided in the traditional a-Frame format and are created from high quality, computer generated images. As well as getting the 36 miniatures, a large scale, full colour portrait is also included for each of the miniatures. This title was added to our catalog on May 07, 2008.